Andalucia is blessed with a wealth of culture, history, mountain scenery and plenty of sunshine. On this trip visit Granada, Seville and Cordoba along with spending a couple of nights off the beaten track in a traditional posada in a charming little village. Arrive in Granada and check-in at he hotel. Located at the foot of the Sierra Nevada Mountains, Granada is a historical gem that is blessed with a stunning fusion of Spanish and Muslim art and architecture including the Alhambra Palace, the Generalife and the city's grand 16th century cathedral. For the next two nights we will be staying in a small friendly hotel in the quieter El Realejo neighbourhood of Granada. Our hotel is in a characteristic Granada house with antique furnishings, a small garden and roof terrace. Most bedrooms are en suite although some do have shared facilities. Rooms are cosy, simply decorated and don't have a television, but there's so much to see in the city that you're unlikely to miss having one. It's around 20 minutes' walk from the Alhambra and 10 minutes' walk from the city centre or there's a bus stop just a few meters away. A short stroll from the hotel is Plaza Campo del Principe with a number of good restaurants and bars where you can sample the local tapas and wine. This morning our Explore Leader will take us on an orientation tour of the city taking in the main points of interest including the Albaicin, Granada's historic and atmospheric old Moorish quarter. One of the highlights of our journey is our visit this afternoon to Granada's iconic Alhambra Palace, a UNESCO World Heritage Site that occupies a small plateau in the foothills of the Sierra Nevadas. Built in the 13th century by Mohammed Iibn Nasr, the founder of the Nasrid dynasty, the palace is considered one of the finest examples of Moorish architecture outside the Arab world. Please note that depending on what time we are permitted entrance to the Alhambra Palace we may do our city tour in the afternoon and visit the palace in the morning. After a couple of hours free in the city this morning we take a taxi to the bus station to catch the midday bus on to the city of Cordoba, the once great capital of the Islamic caliphate of al-Andalus. Like Granada, Cordoba hides a wealth of treasures amongst its rambling back streets and this afternoon we have chance to visit its great mosque, the Mezquita-Cathedral. Another of Spain's UNESCO World Heritage Sites, this extraordinary building represents a unique blend of faiths, housing two oratories and a stunning hypostyle hall that contains 856 columns of jasper, onyx, marble and granite. Tonight we will be staying in a small hotel in the historical centre of Cordoba. It's very close to the Plaza del Potro and the Fine Art Museum and only around 5 minutes' walk to the Mezquita. Bedrooms are en suite with air-conditioning and a television. 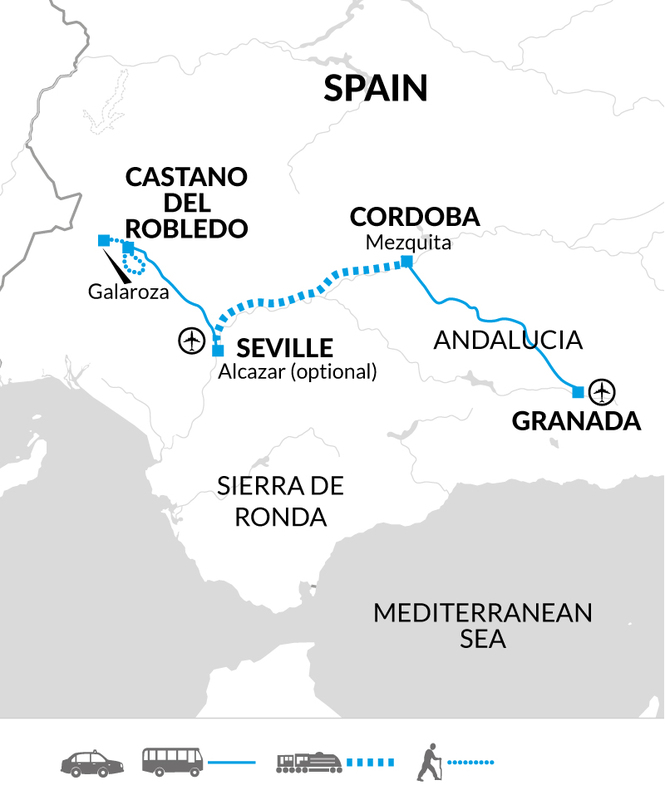 Travelling by train and bus today we head deep into the countryside of rural Andalucia, heading for the small village of Castano de Robledo, close to the Portuguese border. Our destination lies in the heart of the Sierra Aracena National Park, surrounded by a landscape of cork trees and forests of oak and sweet chestnut. Castano is a captivating collection of narrow cobbled streets and whitewashed houses that exhibit the typical 'serrano' architecture of the area. Our guesthouse for the next two nights is within this tiny village. It is filled with rustic character and rural charm and is the perfect base for exploring on foot. You can relax after a day walking, in its courtyard and garden, on the terrace or in the comfortable upstairs lounge filled with books. All the bedrooms are different and have their own character. Most are en suite but some have shared bathrooms and they don't have televisions. After breakfast this morning we walk to the picturesque 'pueblo blanco' (white village) of Alajar, famed for the imposing 17th century shrine of Arias Montano that occupies a rocky promontory high above the village. We return to Castano on foot (total walking distance 12 kilometres). This afternoon you may wish to visit the town of Aracena, home to the famous 'Gruta de las Maravillas' (Cave of Wonders), set amidst one of the most spectacular cave systems in the country. If time allows there may be chance to pay a visit to the caves (optional). Lying to the northwest of Seville, the Sierra de Aracena is a remote western outlier of the extensive Sierra Morena and the quiet, easy paced, way of life here remains definitively Andalucian. The wooded hillsides support a smattering of tiny whitewashed villages, with rural economies still reliant on the production of quality cured hams, chestnuts and cork. We have a chance to enjoy more of this rural idyll today, with a walk to the nearby village of Galaroza, in the beautifully scenic Valley of the Ribera de Jabugo (walking distance approximately 6.5 kilometres). Later in the afternoon we catch the bus to Seville. Our bags will be transported separately to the bus stop in Galaroza. For the next two nights we will be staying in a small hotel which is a converted old 17th century mansion in the Santa Cruz district of historical Seville. It's only around 150 meters from the cathedral and the Alcazar. The hotel has a restaurant serving traditional tapas and Andalucian cuisine. The bedrooms are set around a pretty courtyard filled with wood carvings and traditional ceramics. Rooms are en suite with air-conditioning and they don't have televisions. The Andalucian capital can trace its ancestry back over two thousand years. It is now home to three UNESCO World Heritage Sites and is one of the three largest Old Towns in Europe (Venice and Genoa being the other two). Today is free offering a chance to take in the delights of the Alcazar and the city's immense Gothic Cathedral. You may also want to take a walk through the city, taking in its beautiful 'Mudejar' architecture (a mixture of Christian and Moorish styles) Or perhaps even enjoy the views from the top of the Giralda Tower. Trip ends after breakfast. If you are staying on you may wish to explore the city further, perhaps visit on of Seville's many museums. Royal Chapal €4.00 per person entrance; cathedral free entrance; Baroque Monastery San Jeronimo €4.00 per person entrance. Real Alcazar €4.50 per person entrance after 9.30am; Caliphal Baths€2.50 per person entrance after 9.30am; Torre de Calahorra entrance €4.50 per person. Cave of Wonders per person entrance is € 8.50 with an additional €10.00 for return transport. Cathedral and Giralda Tower €9.00 entrance per person; Real Alcazar €9.50 entrance per person; Plaza de Espana free entrance; bike hire €8.00 for three hours; Flamenco show between €12.00 and €23.00 per person; Pilates House €8.00 entrance per person; Archaeological Museum €3.00 per person entrance; Navigation Pavillionchindler Tower €5.00 per person entrance; Saint George Castle free entrance. During the summer months we recommend you bring a sunhat and sunscreen as temperatures can be very high. A torch is generally useful to travel with. Although entirely voluntary, tipping is a recognised part of life in this region of the world. Some local staff will look to members of the group for personal recognition of particular services provided. Accordingly, you should allow € 10 for tipping drivers and site guides. In order to make things easier for you, your Explore Leader may organise a group's tips kitty and if this is the case, they will account for it throughout the trip. On this trip you are able to choose to purchase a single room (please see the dates and prices for the applicable single supplement price). However, this option is only available for you to have a single room on days 1-3 and 6-7 of this holiday. On days 4-5 we're not able to offer single rooms, as the guesthouse we use only has enough rooms to accommodate all the passengers on a full group on a twin share basis. For the majority of nights on this trip we use simple accommodation, so there won't be hairdryers or tea/coffee making facilities in the bedrooms and some won't have a television, although the views are so stunning and there's so much to see and do that you're unlikely to miss having one. The majority of bedrooms are en suite, but sometimes you may have shared bathroom facilities. This trip includes countryside walks on two days for an average of three hours per day. Walks are graded as Easy to Moderate.